Fifty or more people – the majority under 10 years of age – filled the library’s meeting room to see and learn about her feathered friends. And while the room was filled with the kind of energy and excitement that only toddlers can bring to a confined space, once Mager and her birds took center stage I have to say, I’ve never seen that many young minds that focused for that long. Of course, Mager is a pro. She has been an avid avian advocate for more than four decades. It began in Maitland, Florida where Mager worked for the Florida Audubon Society. Her efforts, including spending six nights and seven days in an abandoned bald eagle nest, helped raise money for an aviary to care for injured raptors. That aviary underwent a $2 million facelift and reopened in 2001 as the Audubon National Center for Birds of Prey. 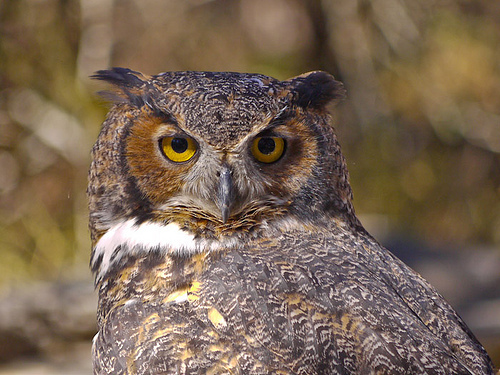 The facility has treated 10,000 or so injured birds of prey since its inception in 1979. Mager left the Florida Audubon Society in 1983 to create the non-profit SOAR (Save Our American Raptors.) With her focus on children, Mager with her birds in her van crossed and crisscrossed the country from Cape Cod to Savannah, across Texas and New Mexico and the Carolinas presenting more than 200 programs a year at schools, libraries and other venues. For a short synopsis of Mager’s “bird life” go to http://www.smokymountainnews.com/issues/6_01/6_20_01/out_raptors.shtml to see an article I did in June 2001. Mager was 74 when I interviewed her for that piece in 2001. She said then that she intended to “go till God gives me the sign.” It looks like “go” is the only sign she’s seen. And it was apparent last Friday that when it comes to raptors, Mager’s enthusiasm has not waned – even the toddlers were in awe. And, more importantly, they were listening. A youngster asked Mager what someone his age could do to help birds. She responded, unhesitatingly, “leave them alone.” She explained that wild things are meant to be wild and unless an animal is sick or injured the very best thing one can do is to simply leave them alone. Friday night at the dinner table my wife asked Maddy (our 4-yr. old) what she learned at the library. With no coaching from dad, she responded, “Leave wild things alone.” Which is a great lesson for my girls right now, with a Carolina wren feeding fledglings in a hanging basket at our back door. And while Friday’s program was geared to kids, it was quite informative and the facts were accurate. I noticed lots of adults paying attention and Mager does do programs for more sophisticated bird lovers. 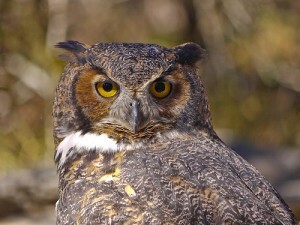 But if you have a budding birder or someone you want to introduce to the wonders of nature be sure to catch Mager and her friends at the Fines Creek library on Monday June, 28 from 10 a.m. to 12 p.m. She and E.T., Cara, a 34-year-old crested cara cara, plus a screech owl and an American kestrel are sure to please. Much of Mager’s tenure as “eagle lady” is recorded in the book RJ: Tribute to a Golden Eagle published in 1997 by Aquilla Press in Clyde.